For AEROdisc we have transformed the Musca remote control and the Aquarius receiver into a true AEROdisc product. The company in Germany/Belgium has developed a rotating platform specially designed for hangars housing smaller (sport-) planes. The platform is extremely low at 6 cm, comes in four standard diameters from 18 through to 25 meters and can carry sport planes weighing up to 2000 kg. Space has to be paid for. A solution such as the AEROdisc ensures that space at the airport can be used more efficiently. Using the Tyro wireless remote control makes it possible to park the plane indoors or outdoors yourself. For the owner of the hangar this means less expenses on staff. Time has shown that most damage is caused while manoeuvring the planes in and out of the parking area. The six centimetre high, self-supporting disc limits these risks. 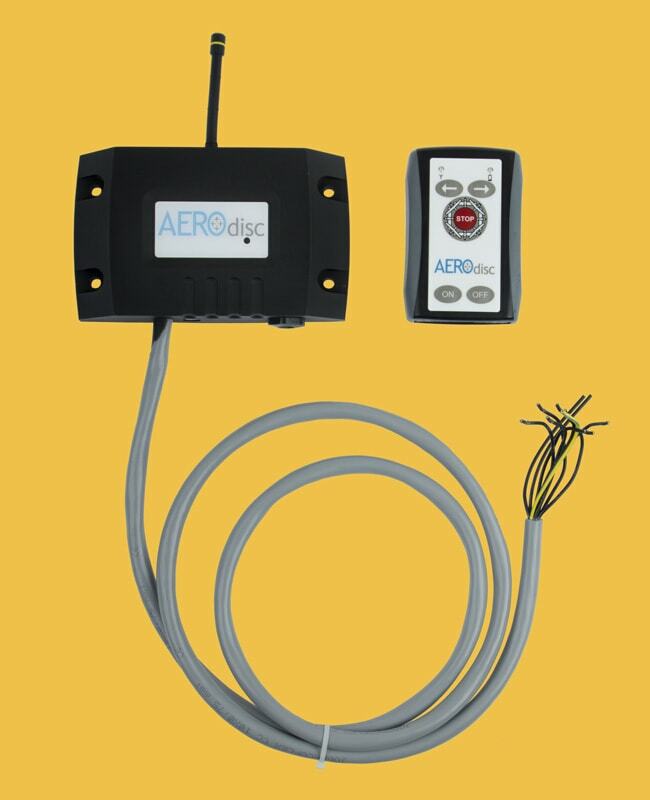 In cooperation with AEROdisc a closer look has been taken at the functions that the radiographic remote control needs. The number of channels required, how these can be applied by the end user and where these will be connected. This emphasized the need to give the remote control its own logo and own symbols. Because the operation only requires two channels for the left and right movement of the AEROdisc (with stop function), the Tyro Musca is the ideal radiographic remote control for the function. By applying an operational foil in own house style and own logo on the receiver it creates a stronger brand experience for the end user. This entry was posted in Industrial automation. Bookmark the permalink.